Hollyn, a Christian performer from Pike County, sings Thursday evening at the 2018 Festival of the Bells at Southern State Community College in Hillsboro. Christian music performances kicked off the 2018 Festival of the Bells at Southern State Community College after strong storms earlier in the day knocked out power throughout Hillsboro. 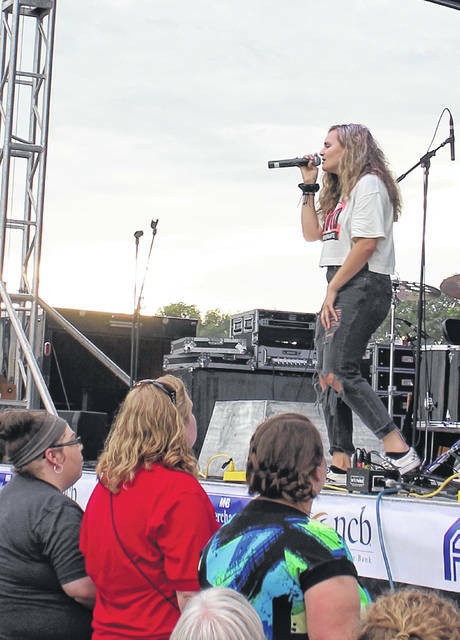 Hundreds gathered at the festival as Christian singer Hollyn, a Pike County native on TobyMac’s label, performed an opening act for Unspoken, a Christian group that has been on numerous Christian music charts and toured with Big Daddy Weave and Sanctus Real. A torrential downpour with sporadic lightning moved through the area in the late afternoon Thursday, cutting power to a large portion of town, but all appeared to be in order at the festival when the performers took the stage. In other musical acts scheduled for the weekend, country music artist Dylan Scott was set to perform Friday with an opening show by local performer Patrick Roush. Adam Doleac, another country artist, was scheduled to be the main act Saturday following a performance by Cincinnati rock group Bad Habit. Expanded parking will make for easier access to the event, and festival goers will enjoy a larger seating area and more rides, he said. There will also be more access to vendors, as well as a dining tent, a larger tent for arts and crafts, and a place to stage photos. COSI, a Columbus science museum and research center, was scheduled to set up at the festival from 1:30-4:30 p.m. Friday. Shuttles were set to be available from 11 a.m. to 1 p.m. Friday to people from uptown Hillsboro to SSCC. Williams said the shuttles are primarily for workers in town to get lunch at the festival.